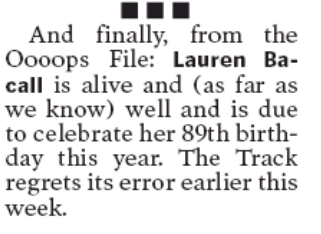 As the hardreading staff previously noted, Wednesday’s Boston Herald had the Inside Track killing off Lauren Bacall prematurely. We also noted that there was no correction in Thursday’s Herald. Respeck to Track Gal Gayle Fee. Good to see someone at the feisty local tabloid knows CPR. P.S. Our original item got Two-Daily Town a nod from the redoubtable Jim Romenesko. Dear Diary . . . This entry was posted on Friday, February 14th, 2014 at 3:09 pm and is filed under Uncategorized. You can follow any responses to this entry through the RSS 2.0 feed. You can leave a response, or trackback from your own site.